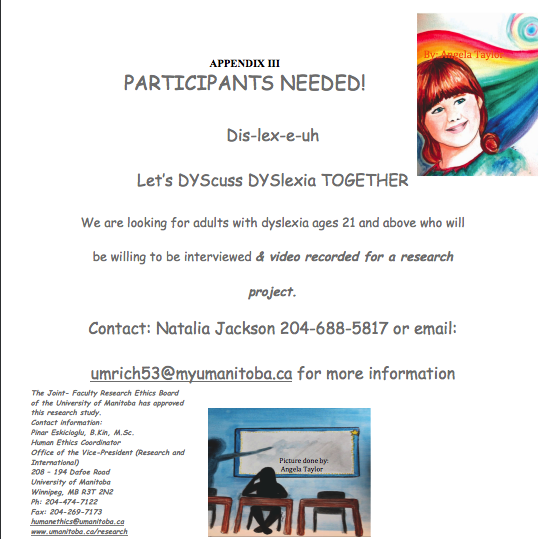 Invitation for Adults with Dyslexia to Participate in a Graduate Research Study at the University of Manitoba. We are looking for adults with dyslexia, ages 21 and above, who will be willing to be interviewed & video recorded for a graduate research project. The purpose of this research is to find out the past and present experiences of adults with dyslexia, and present the information in a manner that adults with dyslexia can access and consume. Participants will be asked to answer questions about their current experience as an adult living with dyslexia, as well as their experiences growing up with dyslexia; which will include emotional, social, work, and educational experiences. The time commitment is expected to be about 1 hour. What are the emotional & social experiences of adults living with dyslexia in Winnipeg, Manitoba? What are the strategies adults with dyslexia utilize to navigate daily living in Manitoba, Canada? What resources are currently available for adults living with dyslexia in Manitoba, Canada past and/or present? This study has been through a rigorous ethics approval process through the Ethics Review Board at the University of Manitoba. The Dyslexia Champions of Manitoba are hosting the symposium on October 21 in recognition of Dyslexia Awareness Month. The symposium is designed to provide families with advice and guidance on how to best support children with dyslexia. Hear from parents, teachers, reading clinicians, psychologists, successful entrepreneurs, disability advocates, Orton-Gillingham tutors, and most importantly - a panel of students living with Dyslexia. The event is FREE. However, we ask that you pre-register. Space is limited. Refreshments will be served. SOLD OUT. Thanks to all who registered! Please attend our two upcoming professional development sessions on October 20 at Victor H. L. Wyatt School in Winnipeg offered through Manitoba Multi-Age Educators (MAME). Please see link for details and registration. • to promote and provide teacher training. Using the response to intervention (RTI) model, presenters will outline an assessment approach to target instruction. Our goal is to help educators in all capacities - classroom teachers and specialists, to identify students who require specific Tier 2 or 3 intervention. A model for screening and progress monitoring for those who struggle with reading and writing will be provided. The presentation is based upon current practice in a Manitoba public school division. Each presenter has had Orton-Gillingham accredited training and intense, supervised practice. As such, we are advocates for Orton-Gillingham as it is based upon a multisensory, direct and diagnostic instructional approach. Orton Gillingham utilizes applied linguistics and systematic phonics which is diagnostic, sequential, incremental and cumulative. The instructional approach is intended to facilitate learning with persons who have difficulty with reading, spelling, and writing of the sort associated with dyslexia. The Orton-Gillingham Approach can be used effectively with the whole class, small group and/or as 1:1 intervention. It is properly understood and practiced as an approach, not a method, program, system or technique. In the hands of a well-trained and experienced instructor, it is a powerful tool of exceptional breadth, depth, and flexibility. Presenters will include information about practical resources and activities for classroom and special education teachers as well as literacy specialists. Globe and Mail Article - "Dyslexic Kids in Canada Deserve Better"
Consider signing the Dyslexia Canada Petition to legislate compulsory student early-assessment testing for dyslexia in Canada. Read letters from Dyslexia Champions of Manitoba to Manitoba’s Premier, Honourable Brian Pallister and Manitoba’s Education Minister the Honourable Ian Wishart. DCM has requested a meeting to discuss how we can work together with the new Provincial government to support children with dyslexia in Manitoba schools.